SPITFIRE is a research project funded by the European Commission as part of the FIRE initiative which aims to integrate the emerging Internet of Things (IoT) and the Semantic Web. 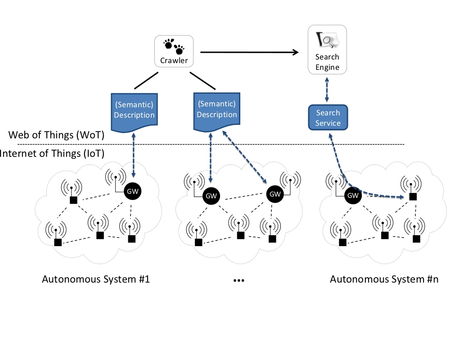 In SPITFIRE, semantic annotations are developed to describe embedded sensors connected to the IoT, their output, and the objects they are attached to; such that applications can be developed that combine the semantic world knowledge available on the Web (known as Linked Open Data) and real-time information about the state of the world gathered from sensors. SPITFIRE also designs fundamental protocols and services to support the development of such applications. Our group contributes to a service that supports automatic inference of semantic descriptions of a sensor based on the semantic descriptions of other sensors. Further, we are working on a service to support content-based search for sensors.